In March 2018 I was instructed by Eloise Todd, CEO of Best for Britain, to work - with Jessica Simor QC - on a case based on my argument on the European Union Act 2011, which outlined in an article for InFacts here. The case was crowdfunded in Crowdjustice, and the relevant page is here. The case was complicated by the fact that at the same time the Withdrawal Bill was going through Parliament. In the end, the Government conceded that there would have to be an act of parliament before the Withdrawal Agreement was to be ratified . But at the same time the Government repealed the 2011 Act through an obscure clause in what became the EU (Withdrawal) Act 2018. I explain all this in the infographic below. Best for Britan told the story in an email to supporters which I attach below, because it is of general interest. A more detailed note appears here. Since we sent our pre-action letter to David Davis on 8 March, a lot has happened. For one, David Davis isn't even Brexit secretary anymore, and the Government's Brexit could not be in a bigger mess. Here's a quick reminder of the course we set out on. Our case was about the appropriate way for deciding Brexit. The Government was ignoring longstanding and constitutional safeguards. We sought to challenge the sidelining of Parliament in this process, to prevent the Government railroading through whichever kind of Brexit they so chose. Brexit is a process we believe must be decided by our elected representatives - MPs, and the people. Our case was about defending the 2011 European Act, and two key issues within it. Firstly, the 2011 Act provides for a meaningful vote in Parliament through an Act of Parliament. Secondly, the 2011 Act states that a referendum would be needed before the UK could transfer more power to Europe. Given the transition element of the EU deal we were negotiating, which would, if Brexit were to happen, transfer powers to Europe, as well as the possibility of a Brexit deal that also gives up our powers to regulate on some issues, a people's vote was a right we should have already had. With the government denying us not only a referendum but the right to a Parliamentary Act to pass Brexit and therefore the right to a truly meaningful vote, we had to fight. The Government responded to our letter unsatisfactorily. We began to prepare our detailed grounds for action. However, at the same time, the passage of the European Union (Withdrawal) Bill in the Lords created a great deal of uncertainty. We wrote again to the Government on 24 May asking directly and explicitly if they intended to ratify the withdrawal agreement without an Act of Parliament. We emphasised that this would be the first time in 46 years in which a British Government would have ratified an EU treaty, with direct effects, without first securing an Act of Parliament. Ultimately, the Government conceded on the meaningful vote. Between March and June their position shifted to confirm that an Act of Parliament would take place before ratification. This Act will permit Parliament to debate and decide on whether to authorise Brexit and gives one route as to whether there will be a people's vote. The Government's concession has secured Parliament a meaningful say over Brexit. For these reasons, we have decided not to proceed with issuing our claim. The sovereignty of Parliament remains intact. Also, Parliament didn't deny the Government the right to repeal the 2011 Act, and so earlier in July the Government repealed a few parts of the Act - cynically enough, just those parts that relate to the right to hold a people's vote if powers are transferred to Brussels. However, as mentioned above, Parliament will have at least one route by which to consider Brexit and a people's vote via an Act of Parliament - a significant step forward for us all. Once again, we are very grateful for the tireless efforts of our fantastic legal team, Jessica Simor QC of Matrix Chambers, Professor Pavlos Eleftheriadis of Francis Taylor Building, and Polly Glynn and Harriet Davies of Deighton Pierce Glynn. Their hard work and dedication has been vital to this positive outcome. Even more, however, I am grateful to you, our supporters and funders, for making this case, and this victory, possible. With just a few months of the Brexit fight ahead, we promised you that every penny of the crowdfunded money would be spent on fighting for a people's vote and to keep the right to stay in the EU on the table for Parliament and people. 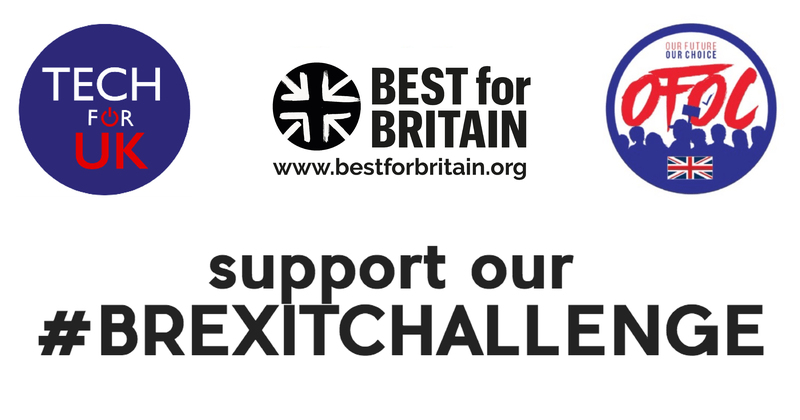 on behalf of Best for Britain, Tech for UK and OFOC. PS - for a full briefing note on the outcome of our case, do click here.